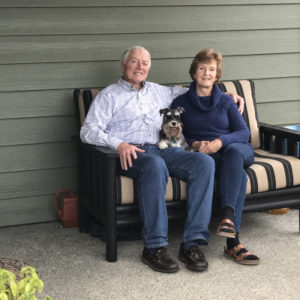 Lily and Mike have lived in the Comox Valley for 20 plus years and had never been in “The Ridge” area until 2013 when they were searching for a geocache hidden in the woods just beyond Buckstone Road. They took the time to explore the area and immediately fell in love with “The Ridge”. Fast forward a couple years and they built a home on their own. They met with the developer Bruce Clapham to discuss the lot they had picked for their first house. They built their first home for resale, and built their second home next to the park which they now call their “forever home”. The subdivision is growing but that seemed to only add new friends to the bonds they had already kindled. It is not uncommon for neighbors to be relaxing in their front yards only to be joined by friends for an impromptu social gathering. The developer Bruce Clapham really cares about creating a community neighbourhood at “The Ridge” and has donated the funds for our annual “Block party” for the past few years. This event has brought neighbors old and new together and has helped immensely to create friendships and make the community feel like a large extended family. We are minutes from town, yet it feels like we are living in a rural setting. There is no thru traffic here and no overhead wires to spoil our great views. Donna and Jim decided to make the big move to Vancouver Island in 2016. They had lived in Kingston, Ontario for over 50 years and after their two sons moved to British Columbia, they decided to follow. The question was, where on Vancouver Island were they going to live? They had looked at other communities on Vancouver Island and chose the Comox Valley as it offered everything they were looking for, including a doctor who was taking new patients, a new hospital and a community located about half-way between the cities where their sons lived. They came across The Ridge website and decided to take a drive through the scenic subdivision. 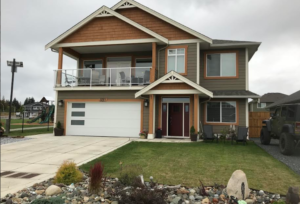 After meeting the developer and viewing a Lawmar Contracting home under construction, they made their decision on the spot to purchase the home and moved in on December 1, 2016. Donna and Jim thoroughly enjoy living at The Ridge. They really appreciate the multi-generational aspect of their neighbourhood and having young children, families and retirees in their community. The neighbours are friendly and welcoming. As an added bonus, Jim loves being in such close proximity to many top-rated golf courses. 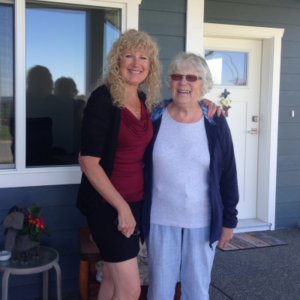 “I was looking for a home where my mom could move in with me and we learned that The Ridge allowed legal suites to be built within the subdivision. We went to see The Ridge and fell in love with it. This is a quiet neighbourhood with beautiful views and pathways and parkways for walking. There are excellent trails for biking and we are located walking distance to the ocean. It feels like we are living in the countryside within the city. Jodi and Michael are avid mountain bikers and cross country skiers. They were looking to move from Alberta to Vancouver Island where they could have easy access to enjoy these activities. They also wanted to build a new home to share with Michael’s parents, who are in their 70s. They researched the areas of Victoria and the Comox Valley, and chose the Comox Valley because of the close accessibility to biking and skiing at Mount Washington. As well, the cost of building a new duplex home was more affordable at The Ridge than it was in Victoria. They wanted to build a duplex, with a custom design for their extended family and they found the perfect duplex lot at The Ridge. They built a bungalow-style (single-level) home on one side for Michael’s parents and a two-storey home on the other side for themselves. 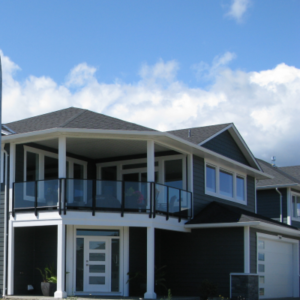 They chose The Ridge because they really like the views of the mountains and of the ocean, the spaciousness of the neighbourhood and the walking trails. They felt welcomed by the friendly neighbours and they enjoy the lack of traffic noise and lack of light pollution. The two families are now happily settled in their new custom home at The Ridge built by one of our preferred builders, Lawmar Contracting.